Magnificent modern villa of 270m², located in the guarded domain of Roca Llisa. Panoramic view of the sea and the wooded hills. The villa is surrounded by several terraces and a garden. The pool and terraces were completely and tastefully renovated in 2018. Peace and tranquility are guaranteed in this beautiful contemporary villa, equipped with 2 enormous terraces, surrounded by wooded hills and with a vast view to the sea. 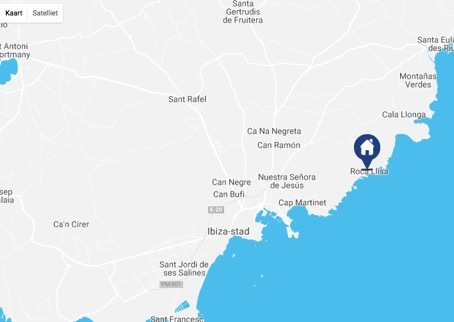 It is located in the allotment Roca Llisa, a large private domain at 7 km from Ibiza, an enclave of luxury and tranquility, far from the hustle and bustle. The property benefits from a privileged location, without a view, but not isolated. The only golf courses of Ibiza are located at 5 minutes, the beach in less than 15 minutes. Open and with lots of light, the villa consists of a main building with 4 bedrooms and a separate studio with 1 bedroom, at the bottom of the swimming pool. Very well installed American kitchen with breakfast bar.